Home » Investing » What’s Your 5-Year Plan? We all should have a five-year plan. Whether it’s to retire, save more money or get a better education, there should be some goal on your radar to achieve in the coming years. And every so often, that goal will change, as it does for many of America’s corporations. See, when interest rates hit historic lows after the global recession, corporations went on a borrowing binge, and their five-year plans consisted of accumulating debt. They did so because their goal was to borrow as much as possible and use that money to fuel their businesses. But over the coming five years, there is a record $2 trillion in corporate debt that either needs to be paid back or refinanced. So these companies that went on a borrowing binge are now turning their sights on how to manage this debt as it comes due. It is officially part of their new five-year plans. First, let’s look at how debt has steadily climbed over the past decade as corporations took advantage of low interest rates. The gray area marks the 2008 recession, and the black line represents the change in total debt of nonfinancial corporations. There was a clear surge going into 2006-2007, then a pause as we went through the recession, and then debt ballooned again. This chart roughly follows the stock market over that time too — running up in 2005-2007, stalling in 2008, then rallying since 2009. But correlating debt to the stock market may just be a sign of investor optimism. 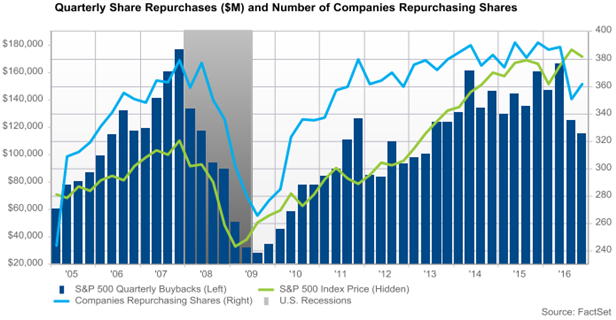 So here’s another item that correlates and is a little more pressing — share buybacks. Share buybacks are when a corporation uses its capital to buy back shares on the market. The goal is to lower its shares outstanding and, thus, increase its earnings per share, since earnings per share, by nature, equals earnings divided by the shares outstanding. The green line is the S&P 500 Index; the blue line shows how many companies are repurchasing shares; the blue bars represent the total value of the quarterly share buybacks; and the gray area once again marks the recession. This is basically the same time frame as the debt chart I showed a moment ago, so you can see how the four data points — total debt of nonfinancial corporations, the S&P 500, the number of companies repurchasing shares and the total value of share buybacks — all have the same tendencies. And that’s why they have grabbed my attention. It’s hard to tell which data points lead which here. All four could just coincidently be following each other … or, and this is the issue at hand, there could be an explicit reason why the four data points are going in the same direction. An easy read of this — and the gloomiest one — is that corporations are using the historically low interest rates to take out debt and, in turn, buy back shares of their stocks. This increases bonuses for the companies’ management, which are based on earnings and share price movements, and also boosts the share prices for the companies — which is what we have seen unfold over the last decade. So it’s fair to say that, with a record amount of debt coming due over the next five years and the Federal Reserve eager to raise interest rates in general, there will be fewer share buybacks and, thus, fewer buyers to support the stock market. That scenario paints a picture of minimal returns out of the stock market in the years to come, with interest rates still stuck near these low levels. This means that somewhere in your five-year plan, you’ll want to know how to outperform a possibly stagnant market — and your best bet is by generating yield. Yield can consistently add income to your portfolio regardless of what your overall stocks are doing, but, by nature, it also allows you to capitalize on the continued bull market. And if you take the right approach to generating yield, you could easily be generating double-digit returns even if the stock market goes nowhere.